KUWAIT: Chief of Staff of the Kuwaiti armed forces Lt Gen Mohammed Al-Khudher yesterday said the serious and continuous security challenges in the Middle East during the past few years demand military cooperation to face them. “Our meeting aims to strengthen our relationship and cooperation to achieve regional and international security and stability. 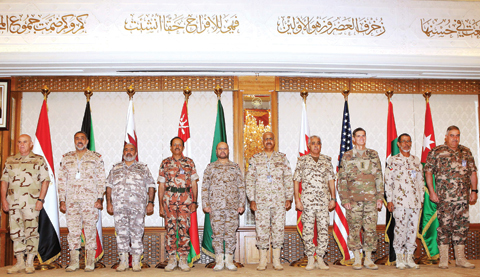 We hope that this joint collaboration will lead to improve our military forces and defense unity to face present and future challenges,” Khudher said during the opening session of a meeting of the Supreme Military Committee of GCC, Egyptian, Jordanian and US chiefs of staff. Commander of the US Central Command (CENTCOM) General Joseph Votel noted that the Gulf region is full of vitality and opportunity, but also “threats to our common security”. “I believe these regular meetings are very important for us to maintain close ties, open lines of communication, foster mutual understanding and advance our collaboration and cooperation,” he pointed out. “Your contributions are crucial with regards to our efforts in Iraq, Syria and Afghanistan and to the stability of the region as a whole. It is important to our common security challenges and developing real solutions to address them, specifically integrated air and missile defense, maritime security and counterterrorism,” added Votel. Votel urged feuding Gulf states to put aside their differences and unite against Iranian efforts to “destabilize” the region. He said it was “imperative” to “enhance and integrate our capabilities for our mutual national security interests” and “rise above all the other aspects”. According to him, two enduring security threats are the destabilizing actions of Iran and violent extremist organizations. “We are not abandoning this region or our partners here, and our Central Command’s priorities here have not changed. We need to face our common threats together – and enforce this way of thinking and operating down to the lowest levels of command,” he said. Votel mentioned areas of contribution including counterterrorism efforts with integrated special operations forces, basing and over-flight rights, strategic airlifts, political statements supporting peace and reconciliation, condemning violence, boots on the ground and supplies, capacity building efforts and others. “I hope this will be a good forum for sharing information and maintaining high level mil-to-mil relationships. The input and opinions you share with me and each other is invaluable toward us taking the necessary steps to ensure our security, achieve our national and shared interest and keep the lions at bay,” concluded Votel. In the concluding session, Khudher thanked the attendees for their efforts in achieving the present and future goals of the armed forces. “I hope these achievements will meet our expectation. The success of our meeting expresses our cooperation and I hope we will continue holding these meetings,” he noted. In June 2017, Saudi Arabia and its allies cut all ties with Qatar, demanding that their erstwhile ally cut longstanding ties with the Muslim Brotherhood and take a stronger line with Saudi archrival Iran. The rift has proved a strategic headache for Washington as Qatar provides the main headquarters in the region for CENTCOM while rival Bahrain is home to the US Fifth Fleet. Kuwait, which along with Washington has led mediation efforts in the crisis, has said it is considering US proposals for a regional alliance to counter Iranian influence.